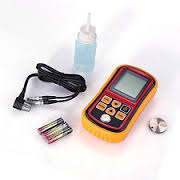 We are engaged in manufacturing and exporting a wide range of ultrasonic thickness gauge, digital ultrasonic thickness gauge and coating thickness gauge that are an easy to use thickness gauge and utilizes a magnetic method to make fast, accurate and repeatable measurement on metal and non metal material. These gauges are used for measuring the wall and the base thickness on bottles with complex shapes without cutting. 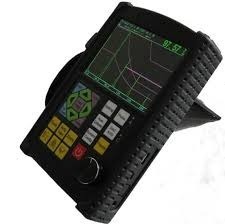 Moreover, these can also measure pre-form thickness of various material. 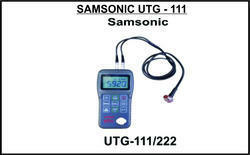 We are offering digital ultrasonic thickness gauge that is available in model UTG111/UTG222. It is based on the same operating principles as SONAR, the instrument is capable of measuring the thickness of various material with accuracy as high as 0.1/0.01 millimeters. These gauges are capable of performing measurements on a wide range of material, including metals, plastic, ceramics, composites, epoxies, glass and other ultrasonic wave well-conductive material. The transducer models of gauge are available for special application, including for coarse grain material and high temperature applications. 1 year warrantee against mfg. defects. 1 year NABL Trecebility certificate free . Two “AA” size 1.5 volt alkaline batteries. 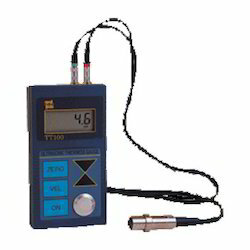 Offering Portable Ultrasonic Thickness Gauges Time TT-100. Time Group ultrasonic thickness gauges measure the thickness of ultrasonic wave wellconductive materials with parallel top and bottom surfaces. It measures the thickness of both metal (steel, aluminum, titanium, etc.) and nonmetal (plastics, ceramics, glass, etc.) parts. 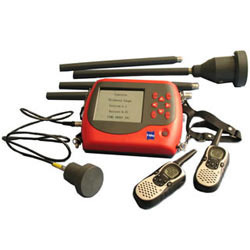 They are commonly used to measure (remaining) wall thickness of pipes and pressure vessels. The display is mm/inch selectable. Automatic calibration. Built-in test block. Accuracy +- (1% h 0. 1) mm, h denotes the measured thickness. Sound velocity range 1000 to 9999 m/s. Measuring range 1000 to 9999 m/s. · Accuracy: ± (1% h 0. 1) mm, h denotes the measured thickness. · Sound velocity selection : unit preset 10 kinds materials velocity inside. · Manual power off : press the button to turn it off. TC300 is used for measuring the thickness of nonmetallic plate indirectly, especially for concrete slab. This gauge is to measure the concrete slab thickness mainly by using distribution characteristics of electromagnetic field and possesses functions of thickness measurement, data analysis, data storage & output etc. 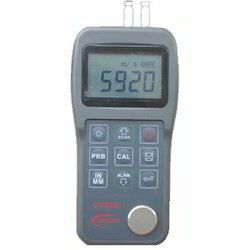 It is a kind of intelligent thickness measuring instrument that is portable, convenient and accurate. 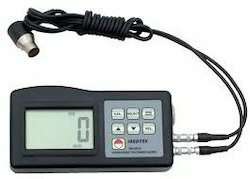 Looking for Ultrasonic Thickness Gauge ?